The temperature - you are adding it to a warm bath. The first one is quite easy to check - add the bubble bath to some cold water, and then some hot water and see if there is any difference. One common thing that changes as you change the concentration of the mixture is the pH - how acid or alkaline it is, and this could be changing it's colour. To test this you can add vinegar or some bicarbonate of soda dissolved in water, to the bubble bath and see if it affects the colour. 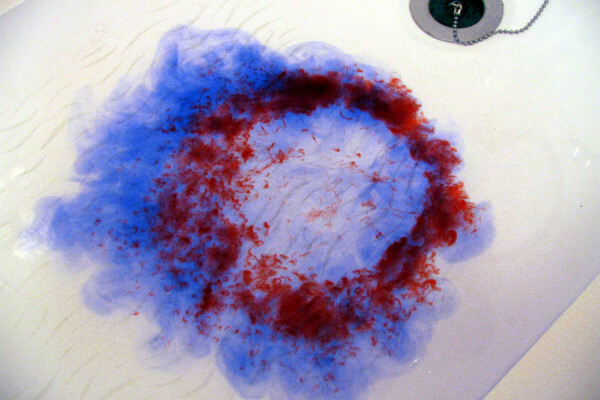 The bubble bath changes colour to blue in both hot and cold water so that can't be making the difference. If you add bicarbonate of soda solution the bubble bath will change colour to blue - possibly an even deeper blue than with just water. If you add vinegar though it doesn't change colour at all and will stay orange. If you then add enough bicarbonate of soda you can make it go blue again (and make lots of bubbles). Acids react with water to form H+ ions (a hydrogen atom with it's electron missing - it actually sticks to a water molecule forming H3O+) which are very reactive and are the reason that acids will react with so many things. A pH indicator is just a molecule that will temporarily react with H+ ions and change colour, but if the H+ ions disappear it will change back. pH is just a measure of how many H+ ions there are in a litre of water (although a strange measure because a low concentration of H+ is a high pH and vice versa). So as you dilute the bubble bath, which starts off slightly acid, the same number of H+ ions are spread around through more water and they become less concentrated. The pH then gets higher and the water becomes more alkaline, making the Bromocresol Green change from orange to blue.